Engineered Oak Flooring- What Is The Difference In Wear Layer Thickness? When compared with solid oak flooring, engineered oak flooring offers a number of key benefits. In order to explore these specifically, we will begin with an outline and overview of engineered oak flooring. The central core can be softwood, MDF or plywood but plywood is the best option because it provides more stability and strength than the others, which improves performance of the finished floor after installation, especially when UnderFloor Heating (UFH) is present. These 3 layers are glued and then pressed together, creating a ‘sandwich’ of timber products, with only the oak wear layer surface being visible after installation. Although the wear layer is what receives all the wear and tear, the central core and stabilising veneer are vital elements for good overall performance. The thickness of the wear layer on engineered oak flooring can vary widely between products and the suppliers of those products, so it is important to know how to choose the best option for your installation. Choosing the right wear layer thickness is such an important consideration when selecting engineered oak flooring because it determines how long the finished floor will last, and how much durability it will provide. Obviously the thicker the wear layer, the more times it can be refinished, so as an example, engineered oak flooring with 6mm thick wear layer will last longer than similar oak flooring with 4mm layer. 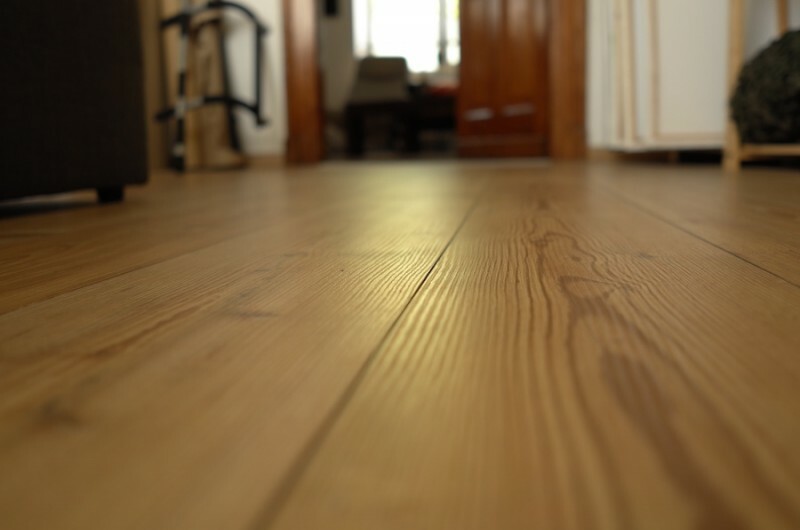 The sanding and refinishing of oak flooring is not a task undertaken very often by most homeowners, but when it is done, it is usually because the floor surface has become worn sufficiently that bare wood is open to the elements and needs to be protected. Sanding and refinishing an oak flooring surface provides a means of removing any signs of wear and tear, and once completed the flooring is restored to its former beauty. Although this is quite a simple process with most oak flooring finishes and is only required after years of use, the wear layer of oak needs to be thick enough to facilitate a number of refinishes to ensure longevity of the floor. Depending on the type of finish applied to the oak flooring, the process of sanding and refinishing can remove a small portion of the wear layer thickness, thus reducing its future durability slightly. When the oak flooring has been sanded so many times that the wear layer is no longer thick enough to protect the central core, then the flooring should be replaced. This is why consideration of the thickness of the wear layer of your engineered oak flooring is so important. To emphasise the importance of this consideration, an engineered oak flooring that has a wear layer of 1mm or less may seem good value when the initial cost is compared, but it cannot be sanded and refinished at all because the oak layer is simply too thin to do so. This obviously reduces the lifespan of the flooring considerably when compared with oak flooring that has a greater wear layer thickness. Because the wear layer of oak is what determines the durability and lifespan of the finished floor, the initial cost of the flooring should be calculated against how long the floor will last, because usually the flooring with thicker wear layer is much more cost-effective. Let’s say that a 14mm thick engineered oak flooring with 3mm oak wear layer costs £23.00 per M2, whereas a 15mm thick flooring with 4mm wear layer costs £25.00 per M2. Because the 15mm flooring is only 9% more expensive than the 14mm flooring, and it provides 33% more durability, it is by far the best and most cost-effective purchase, giving you far greater value for money. How Many Times Can An Engineered Oak Floor Be Successfully Sanded And Refinished? The amount of times that an Engineered Oak Floor can be sanded and refinished is dictated by the thickness of the wear layer on the flooring. The general and obvious rule is that the thicker the wear layer, the more times it can be sanded and refinished. With this fact in mind, choosing an engineered oak floor with a wear layer thickness of 4mm or above is definitely the best option to go for, and when the value for money calculation is applied as shown above, it is usually the most cost-effective option too. The wear layer thickness of all our engineered oak flooring can be seen prior to purchase within the product specification details on the product details page on our website.